To establish the recommendations in Best Pick Reports®, we survey random samples of prospective Best Pick® companies’ past customers. The methods we use are proven and widely used in the surveying industry for a variety of purposes, including scientific research. To measure the quality of a company, our grading process examines survey sample size, standard error calculations, and the probability of positive outcomes. Getting referrals from your neighbors is a traditional method of identifying a company you feel you can trust, but a limited number of referrals does not always tell the whole story. This is why we take word of mouth to the next level and survey thousands of your neighbors every year. By proactively seeking homeowner feedback, we make sure that the reviews we collect are not from a biased, vocal minority, as is commonly the case with online review sites. 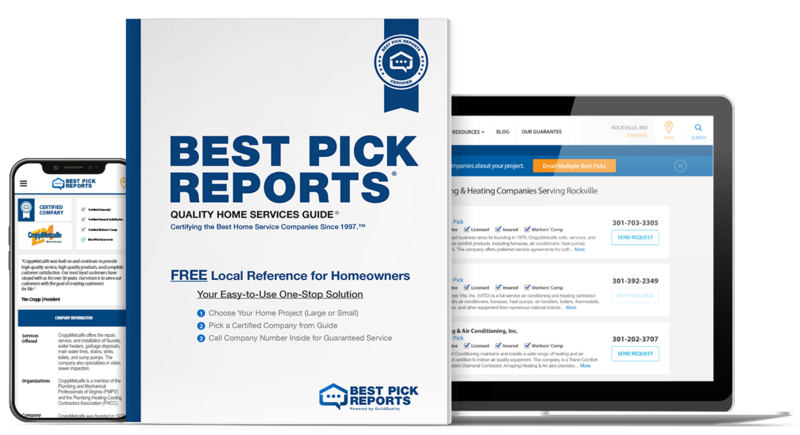 I used Best Pick Reports for tree removal, plumbing, and other things. It's terrific. I'm so glad that I got it, and I will continue to use it. We've had some friends who've said, 'Hey, who would you use?' and we've said, 'We've got this book.' We've shared Best Pick Reports with friends several times. It's definitely good material. I was looking at the Best Pick Reports website recently, and I think it is very helpful. It gave me good ideas about who to hire and what to look for. I thought it was pretty good. The book has a lot of knowledge in it, and the website is good too. I tell people about it all the time. It's great at explaining different things, and it definitely gives people an insight into which companies are above the rest. When you have a problem, you've got to get someone out there, so it's nice to know that you can get someone who is reliable.